Chia seeds are considered as a superfood and are a great source of fiber and antioxidants, a good source of calcium, a good source of plant-based “complete protein” and an excellent source of the plant-derived Omega 3 fatty acid ALA similar to walnuts and flax. Good part is that these are grown in India as well. I buy chia seeds from the local farmers market. Chia seeds pudding is an easy and delicious way to include these in our diets. This is a no-cook recipe and can be eaten as breakfast or any time snack. You can prepare this at night, store it in the refrigerator and breakfast is ready for the next day morning. But we generally cannot eat sweet items for breakfast so I carry this to the office for a mid-morning snack. We can make chia pudding in n number of flavors and combinations. Today I’m showing you with mango as these are in season currently. I have used coconut milk as a base, you can use almond or cashew milk as well. I haven’t tried with dairy milk. Coconut milk is very nutritious and easy to make at home. I always stock up my fridge with coconut milk so that I can use in smoothies, gravy curries, one-pot rice dishes. I also make yogurt with coconut milk. Take coconut milk in a bowl. Add chia seeds, scraped vanilla bean(you can use vanilla bean powder as well) and honey. Whisk everything for 5 minutes and store it in the refrigerator. 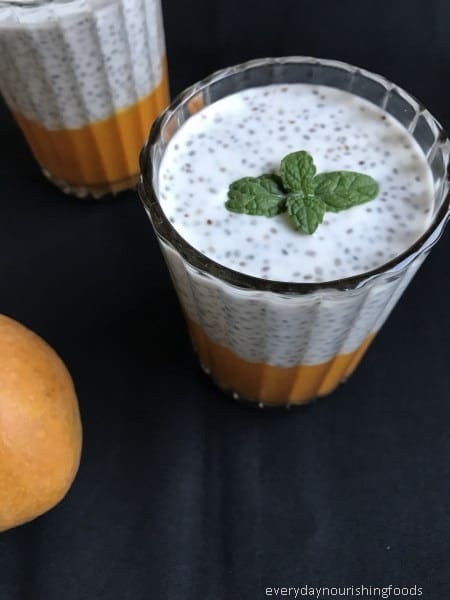 Chia seeds will absorb the coconut milk and form like a gel. It will be ready in an hour. When you are ready to eat, add fruit and serve. You can also add nuts for added nutrition.